Admit it, “Men In Black 3” was great fun. A definite improvement as far as the sequel is concerned, the third installment brought plenty of laughs, excitement and action. It also managed to touch a few hearts too. Thankfully, you’ll be able to relive every marvelous moment and purchase your very own copy of “MIB3” when the Blu-ray and DVD hits stores this tomorrow (just in time for the holidays). And, as one would guess, the Blu-ray/DVD combo pack is full of fantastic features. My personal favorites are the “Spot the Alien” game, in which the viewer must spot the difference between aliens and humans, and the interactive Movie Touch app, which unlocks interactive features from the UltraViolet copy. Free to download from iTunes, the MIB3 Movie Touch app makes it possible for the viewer to become immersed in a plethora of extras. Provided you have an iPad, once you’ve downloaded the film to your UltraViolet collection you’ll have access to filmographies, stills, multi-angle scenes, 360 turnarounds, behind-the-scenes videos, fun facts and more. Plus, while you’re enjoying the film, you can select clips, edit them and share these moments with friends on Facebook and Twitter. Here’s a list of what’s included in the Blu-ray/DVD Combo Pack, Blu-ray 3D Combo Pack and Men In Black Trilogy Limited Edition Blu-Ray Giftset. 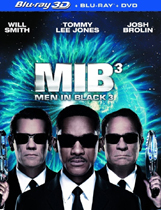 “MIB3” starring Will Smith, Tommy Lee Jones and Josh Brolin, is available Nov. 30.